Four days ahead of Diwali, and the entire northern region sees a sudden drop in temperature! All thanks to snowfall and rains in parts of J&K, Himahcal and Uttarakhand — coming as a boon for the toxin-laden air of Delhi-NCR. The weather conditions which led to the snowfall and rains — western disturbance — have however moved east and are set to leave a positive impact over Delhi-NCR, Punjab, Haryana, Western Uttar Pradesh, with a drop in low moisture winds and temperature. This, experts believe, will provide a much-needed breather to Delhi-NCR which will see an improvement in air quality — for a day. The western disturbance has however passed and hilly states will not see snowfall from Sunday onwards. 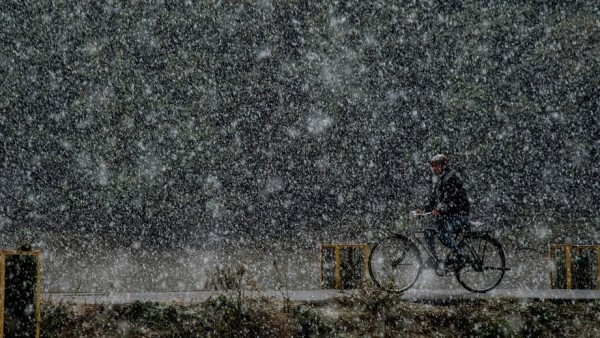 The mercury dipped across northern plains and mountain states on Saturday, with parts of Jammu and Kashmir, Himachal Pradesh and upper reaches of Uttarkhand seeing snowfall and rains. Across the national Capital and regions around it, there were light rain showers, forcing the maximum temperatures to drop by a degree. The morning temperatures of Sunday is expected to see a two-degree drop. The summer capital of J&K, Srinagar, on Saturday also saw season’s first snowfall — it was heavy at Sonamarg, Gulmarg and Pahalgam, both sides of the Jawahar Tunnel on the Jammu-Kashmir National Highway and in the Pir Panjal range. The minimum temperature of Gulmarg was -3.0 degree Celsius while that of Srinagar was 1.8 degrees. The maximum temperature in Gulmarg was one degrees, while in Srinagar it was 6.3 degree. “The western disturbance is passing and the region will now see cold, but dry north-westerly winds, with a bit higher speed, which will bring down the temperatures across northern plains. Snowfall is not expected in mountain regions of Himachal and parts of Uttarakhand,” India Meteorological Department (IMD) scientist M Mohapatra told IANS. The IMD has, however, forecast a possibility of snowfall in parts of J&K towards Sunday as well. According to weather analysts, the winds from north-west, due to their higher speed, will be good for Delhi-NCR air quality. Meanwhile, the mercury is likely to fall across Delhi-NCR region, Punjab, Haryana and western Uttar Pradesh due to chilly winds from the mountains. “The moisture in NCR is set to drop on Sunday and winds are expected to catch up. This will be good for the dispersion of the air pollution,” said Mahesh Palwat, director private weather analyst group Skymet. On Saturday, the maximum temperature of Delhi was recorded at 30.6 degrees, while the minimum temperature was 18.5 degree Celsius. “Sunday’s minimum temperature in Delhi is likely to be around 15 to 16 degrees,” an IMD official said. Light rains in Chandigarh and surrounding regions also pushed the mercury down, with about 19-degree drop in day’s temperature. On Sunday, the maximum temperature of Chandigarh was 25.5 degree, four notches below the season’s average, against the 29.8 degree on Friday. In Himachal Pradesh, while the tourist resorts of Shimla and Manali witnessed rains, other hill stations such as Kalpa and Chitkul in Kinnaur district and Keylong in Lahaul-Spiti received the season’s heaviest snow, the official said. Manali town, which saw a low of 2.2 degrees Celsius, experienced 40 mm of rain, the highest in the state. The maximum and minimum temperatures of Malali were 8.2 and 2.2 degree Celsius respectively. The state capital saw mild rains and recorded the minimum temperature of 7.3 degree. Keylong, which saw a low of minus 1.3 degrees Celsius, recorded 32 cm of snow, the state’s highest. Kalpa, some 250 km from Shimla, saw 4.2 cm of snow. The majestic Rohtang Pass (13,050 feet), located 52 km from Manali, also received snow, according to reports. Dharamsala town saw 5mm of rain and recorded the minimum temperature at 11.8 degrees Celsius, while Dalhousie had 10mm of rain with a temperature low of 5.3 degree.